The best of the Pacific Northwest is all here, starring Portland's own Bee Local honey and Bitterman's salt with two bottles of Willamette Valley Wine - a Pinot Gris with aromas of honeydew melon and pear, and Pinot Noir with berry-rich rose petal notes. One bottle each of Archery Summit Oregon Pinot Noir, and Elk Cove Pinot Gris. For more information on these wines, please see the Tasting Notes. Pacific Wild-Caught Smoked Salmon, Bee Local Honey. Jacobsen Salted Caramels, Seattle Chocolate Overcast Truffle Bar and more. Each gourmet item is carefully assembled, and the gift is accentuated with a hand-tied satin ribbon with optional personalization. A free card is included with your personal message or greeting, as well as complimentary scissors so your recipient can easily open their gift. Your gift will leave a lasting impression as they continue to use and enjoy this exclusive GiftTree basket, perfect for the home or office. Personalize it! A name, date or message can be printed on ribbon, hand-tied around this gift. One line up to 45 characters; text repeats around ribbon. Complete the personalization instructions at checkout. Measures 14" x 11" x 8". 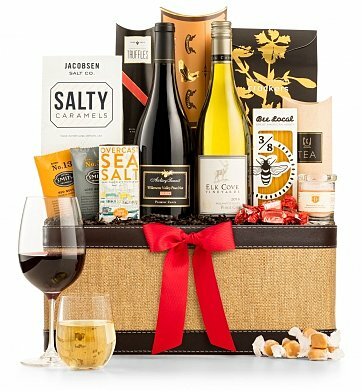 Pacific Northwest Wine Tasting Basket is a hand delivered gift. These gifts are delivered by one of our local design centers located throughout the United States and Canada. Same day delivery is available for most gifts when ordered before the cutoff time. The cutoff time for Pacific Northwest Wine Tasting Basket is 1 PM in the recipient's time zone. Archery Summit Estate Pinot Noir Dundee HillsOregon Pinot Noir was planted first in the Dundee Hills, and Archery Summit is devoted to putting premium Pinot Noir on the map. Enjoy aromas of lilac and violet on the nose, with flavors of cherry, red raspberry and cocoa powder. Bitterman's Himalayan Pink Rock SaltHimalayan pink salt is a salt created from sea salt left from a 600 million year old ocean. Perfect for grinders, bath salts, and grilling prawns. Jacobsen Salty CaramelsJacobsen's confectioners slowly toast the sugar, using premium quality butter that's melted and golden before stirring in heavy cream and generous amounts of their perfect flaky sea salt. Overcast Sea Salt Truffle BarForecast for Fall in the Emerald City is overcast with a chance of melt-in-your mouth dark chocolate (with a hint of Pacific sea salt and buttery toffee). Uses Rainforest Alliance Certified cocoa. Seattle Chocolate Pomegranate TrufflesA chocolate pomegranate cream center is enrobed in rich milk chocolate, creating a decadent truffle that's exclusive to GiftTree. Bee Local Honey SticksBee Local honey sticks are filled with American Wildflower honey. Like all of their honey it's raw, unfiltered and is one of nature's more delicious, nutritious treats. Elk Cove Willamette Valley Pinot GrisAromas of citrus blossom and grapefruit accompany creamy pear and apple flavors on the palette. This lovely white wine is perfect as an aperitif or served with fish, salads or Asian dishes. Steven Smith TeaRare green teas from China are combined with aromatic spearmint grown in the Pacific Northwest and a hint of lemon myrtle from Australia. This seductive Willamette Valley wine leads with vibrant floral notes of lilac and violet. These floral components are joined by touches of cherry, red raspberry, blood orange, and a hint of cocoa powder. Secondary notes of black licorice, berry bramble, and rosemary complement the leading fruit flavors. The flavors are persistent and saturating, enveloping the palate and lingering through a refined, balanced finish. Giving off sweet and light aromas of citrus blossom and grapefruit, this creamy and lush wine offers lovely apple and pear flavors, while showing crispness on the palette. Medium-bodied and balanced, this white wine is perfect as an aperitif, or served with salmon, main-course salads, or Thai and Asian influenced dishes. Willamette Valley Elk Cove Pinot Gris, Archery Summit Pinot Noir. Bee Local Honey and Jacobsen Salted Caramels from Portland, OR. Seattle Chocolate Company Overcast Sea Salt Truffle Bar and more.